June is the psychological and physical turning point in the year when the longest day is over and the days start getting shorter. The fact that we are not ballooning is giving us more time to work on the garden and time is just flying past. We took a short break from work to visit Cornwall for a few days and specifically the Eden Project and the Lost Gardens of Heligan. We spent the rest of the week working on the stone wall in the garden. The panorama of all the biomes nestling in the old china clay quarry gives some idea of the magnitude of the project. Although the planting out is still very immature there has been a noticeable difference between what is there now and photos taken 2 months ago. Whichever way you look, the biomes are so photogenic that you just have to take a picture. This is Jane's favourite shot. This area is still not complete and they were fitting new seating whilst we sat down in the sunshine eating our snack lunch. 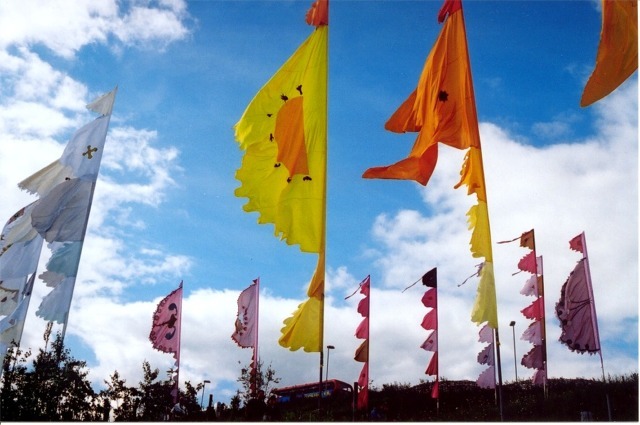 Jane was obsessed by the flags which gently fluttered in the light, mid-morning breeze. 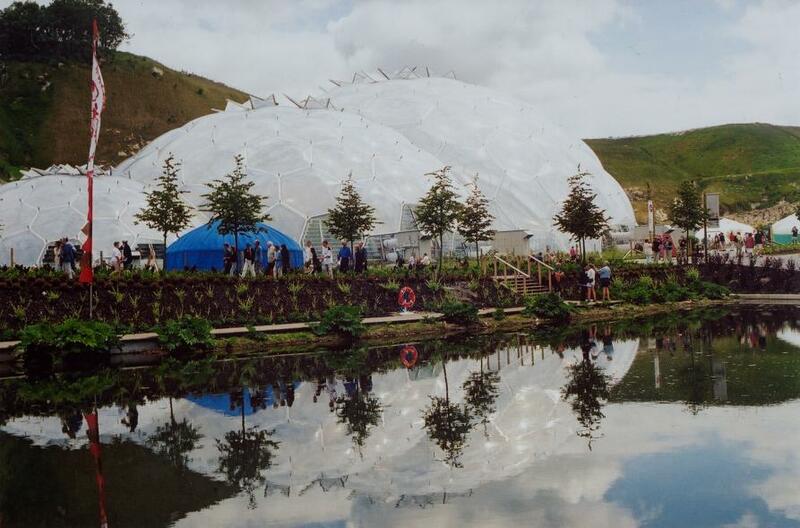 Their shape and colour added to the total effect of the Eden project. Very ethnic and new age in a fresh, realistic style - no hippy beads. Heligan was very different to Eden but has similar ideals - a vision of garden development on a grand scale over a long time. A mud model in the midst of a narrow wood. 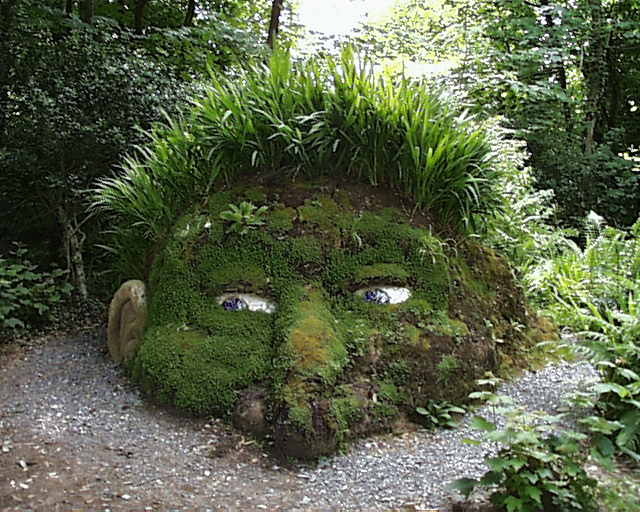 This time using a tree root as the bulk of the face with monbrettia as hair it appears as a troll- like head sticking out of the ground. The wonder of coming across this sleeping beauty amongst the trees at Heligan is difficult to describe. 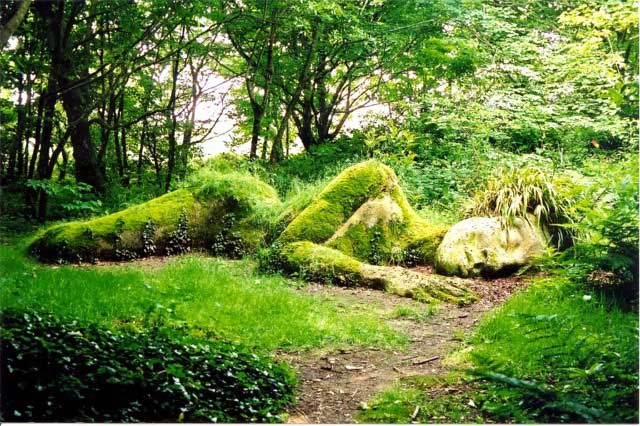 Although she is modelled in mud she has been planted with grasses and in yoghurt to encourage mosses to grow. The Lost Gardens of Heligan are worth a visit for this alone. Steve was happy to pose in the car whilst Jane is out and about snapping interesting walls and creative ideas for the garden. The weather was kind and we spent most of the time with the hood down. Jane managed to stay awake for most of the journey home because of all the fresh air. After seeing so many good ideas in the Lost Gardens it was inevitable that Jane would be alert to any new ideas for the garden. 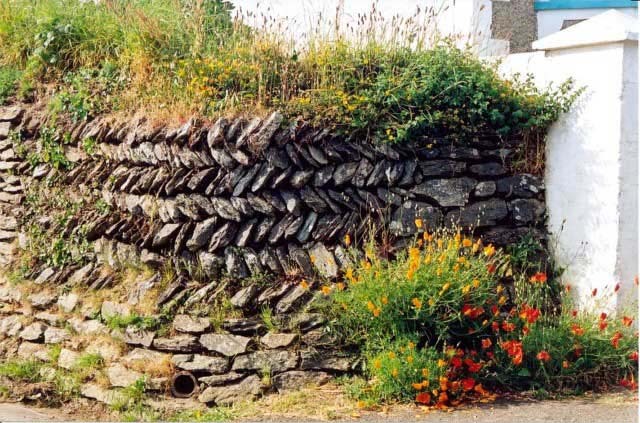 This interesting stone work is something that we will work into our garden wall.